It’s a colorful way to showcase your logo. 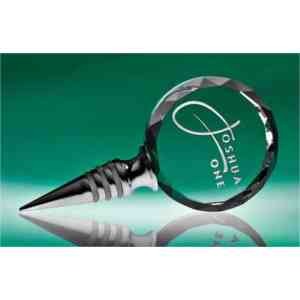 Great as wedding party gift or special event favor at each setting. When a lovely stopper is what you seek, this is hands above a cork stopper. Looks better than any picture can show. Deep laser engraved in 1-1/2″ x 1-1/2″ area. Min is 6 stoppers at 34.00 ea, 25 at 32.30 ea, 100 or more 30.70 ea. No set up. Stopper is 2″ x 5″ and is packed in a beautiful two-toned gift box.Each box features blue and silver laminates highlighted by a square silver button on top. The telescoping lid covers all but the very bottom, while exposing a silver band for a designer look and snug fit. The interior is also lined in blue and silver and is equally luxurious. The box is as beautiful as the crystal stopper itself. Item number 1995.